You can continue working on the code we wrote in the previous article. If you had trouble completing it, please checkout the polymer-book-form branch of the books-service repository. It contains all the code from the previous article. If you have trouble following the exercises in this article, the complete source code can be found in the polymer-book-form-2 branch of the books-service repository. We should provide a way for users of our component to open a book. As in the previous examples, we’ll start with definition of another iron-ajax component. This time, we’ll use it to retrieve a book. Back-end API for retrieving a book is similar to the DELETE request we already implemented. The request should be made to the /api/v1/books/_id/[ID] URL with [ID] replaced with the actual ID of the book we want to retrieve. The major difference is that this time the method should be GET. The specification of the getAjax element is following. Since the default method of the iron-ajax element is GET, there is no need to specify it explicitly. With getAjax up-and-running, we should define the open function that users of our component can call. 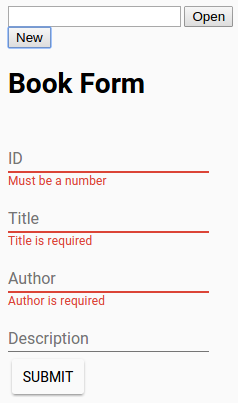 It should populate the form fields with the response from the server or, in case we pass 0 as book ID, clear the fields. For this function to operate correctly we should set the correct URL to getAjax, call generateRequest and display or hide the Delete button depending on whether ID is passed to the function or not. Finally, we might want to define the default behavior of our component. It should present the fields ready to insert a new book. Besides standard Web Components lifecycle callbacks, Polymer adds a new one called ready. It is called when all elements inside the component’s local DOM have been configured. In our case, it should be enough if ready calls the open function we just implemented. The only thing we have left inside this component is to specify what should be done when we receive responses from the back-end server. We are performing three different requests to the back-end server; GET, PUT and DELETE. Responses from those requests can be successful with code 200 or contain an error. Whatever the response, we should notify users of our component so that they can decide what to do next. Notifications can be done by firing custom events. Polymer has fire as one of it’s utility functions. We’ll start with a function that will handle GET response and continue with the rest of 200 responses. Apart from making sure that function itself is defined, we should take the response and set it to the _data property that we defined in the previous article. Finally, we’ll fire the getBook custom event. Similar should be done with PUT and DELETE responses. We should also react when the server responds with an error. We already have the generic _handleError function that can be used. Finally, we should make sure that the functions we just implemented are called from iron-ajax components. It contains onResponse and onError functions that can be used in such cases. The full implementation or our iron-ajax components is following. This concludes the development of the tc-book-form component. Please open the http://localhost:8080/components/tc-books/demo/index.html to see the end result. What can we do next? Let us explore ways to utilize it. We’ll try to give a bit more life to the existing demo and simulate few of the usages the component might have later on when we import it to the application. We can, for example, add HTML elements and script that would tell the tc-book-form component to open an existing book or a new one. Bear in mind that what we are about to do is temporary. In the next article we’ll create a new component that will list books and have options to tell the application to open a book. Please open the components/tc-books/demo/index.html. It contains the demo of the component we just built. We’ll start by adding an input and two buttons. Add following HTML below the body tag. Now we’ll create openBook and newBook that will call tc-book-form open function. Depending on the ID we pass, a new book or an existing one will be opened. As you can see, there is no need for us to know internals of the component but only those properties and functions that are exposed to us. We can try it out by opening the http://localhost:8080/components/tc-books/demo/index.html. Fill in the form and press submit. The book info has been stored in the back-end. Press the New button. The book form has been cleared and is ready for us to populate it with data of a new book. 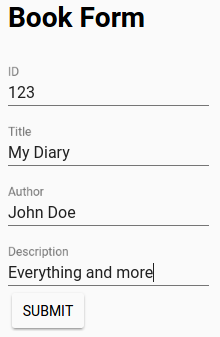 Put the number of the book you submitted into the input field left of the Open button. Press the Open button. The book was retrieved from the back-end and the form has been populated. We might, for example, display notifications whenever some book is added, updated, removed or retrieved. This can be done with paper-toast component and utilization of custom events that our component is firing. Add following to the index.html body. From now on you’ll see messages whenever one of the book operations is run inside the component. What we did above is only a quick “workaround” to showcase how we can interact with Polymer Web Components. In the next article we’ll develop the second component that will list all available books and be able to fire custom events. Those events will be used to communicate between the two components. Once both components are done we’ll move on and use them in a separate Web Application. The story continues in The Second Component article.